A group of US students is building a motion-controlled flight simulator based on the Viper spaceships from sci-fi series Battlestar Galactica. The team has already received $6,500 and has turned to crowdfunding to get their project off the ground. The students estimate they can build the simulator for $17,000, full details at Bit Tech. 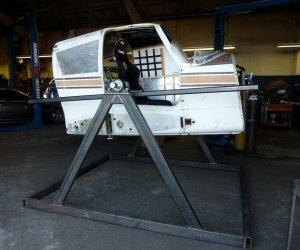 Using a Piper PA-28 fuselage rescued from an aeroplane scrapyard, the team hopes to build a DIY flight simulator capable of 360-degree rotation across pitch and roll axes. For those of a certain age: imagine a Sega R360, except with a real aeroplane cockpit attached. Not content with creating from scratch the kind of high-detail motion-controlled simulator usually reserved for large Japanese video game companies and military contractors, the team also plans to theme the interior and exterior according to the Viper attack craft used in the Battlestar Galactica TV programme. While a typical professional-level simulator costs millions of pounds, the students are hoping to create theirs for a mere $17,000 including the Arduino microcontrollers, motors, monitors and a powerful gaming PC to run the simulation itself.